Griffin Technology, a well known maker of iPhone and iPod accessories, announced today that they had released their first game for the iPhone and iPod Touch: 5 Card Touch [App Store]. 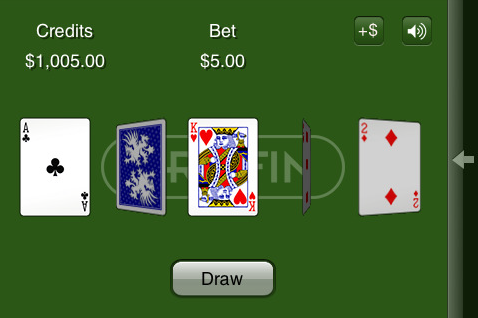 The game is described as a “Vegas-style" video poker game and is the first in a series of applications coming from Griffin. “We are thrilled to roll out an even greater selection of offerings for iPhone and iPod owners" said Paul Griffin, founder of Griffin Technology. “Now Apple fans can get everything they need for their iPhone and iPod collection from Griffin, including cases and accessories, interactive games and more"
Griffin Technology? Making an iPhone game? My curiosity piqued, I immediately went to download the $1.99 game. Overall, I was disappointed, even at $1.99. I mean, it is what was advertised: video poker (specifically Jacks or Better). The game provides you with an initial $1000 bankroll and the ability to add money at any time, but the game is as basic as can be. It also goes against the video poker convention with which I am familiar where you select which cards you would like to keep (or hold). Instead, you are expected to tap on the cards you wish to discard. This may seem like a minor point but uncomfortable to play if you are used to the other method. While I’m encouraged that the iPhone is attracting more developers, I’m hoping to see more substantial offerings from Griffin in the future.